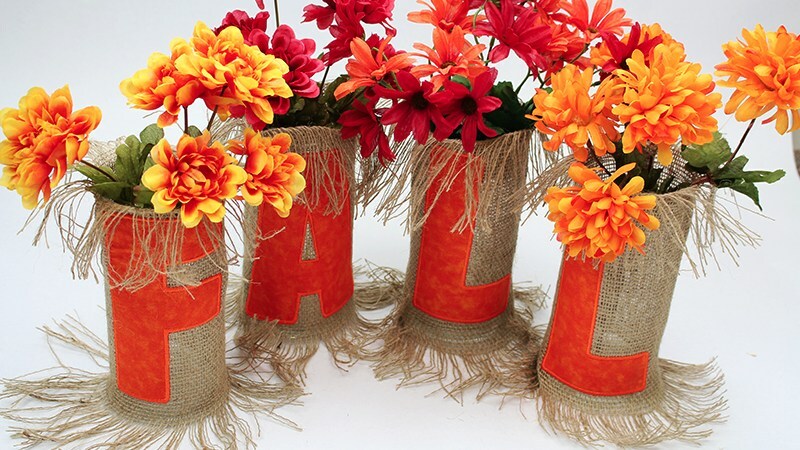 Now here is a quick, easy and fun fall project for you. Since orange gourd designs are appropriate through Thanksgiving, you can stitch up a whole pumpkin patch of these to share. 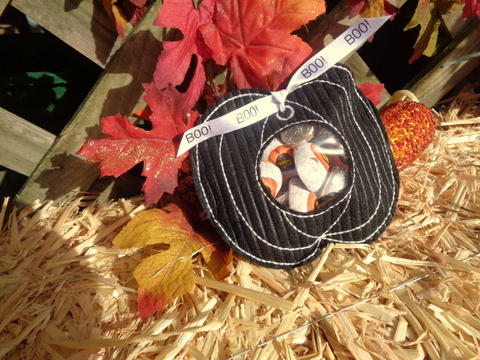 Even without an embroidery machine, you could trace a pumpkin and stitch the entire project on your sewing machine. 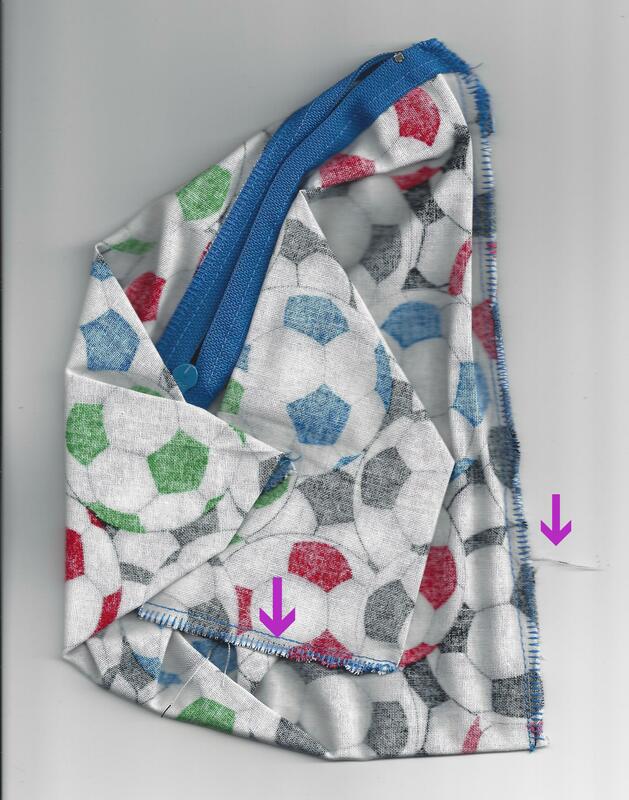 A detailed photo tutorial and the free design in 4×4 a d 5×7 are available at Brother’s blog, Stitching Sewcial. 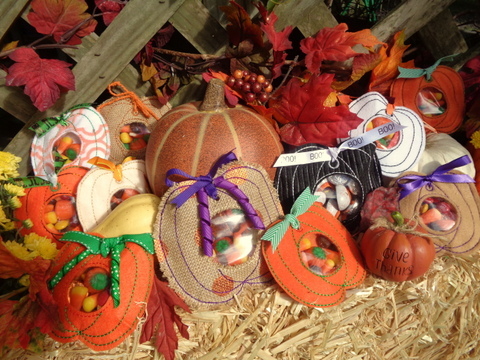 You can be very creative with this little pumpkin, using various colors of felt, burlap or even a sturdy fabric. I especially liked using my Brother P-touch Embellish ribbon and tape printer to print BOO! for the black pumpkin tie. There are so many great projects posted at Stitching Sewcial, like Angela Wolf’s lovely burlap jar covers embellished with Scan ‘n Cut letters FALL. Having recently purchased a Scan ‘n Cut I was especially interested in this project. 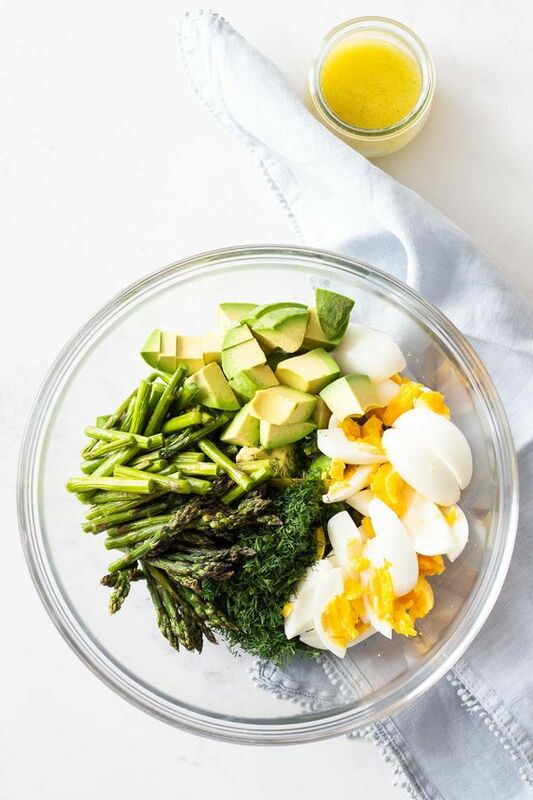 Check out Angela’s post and her tutorial here. 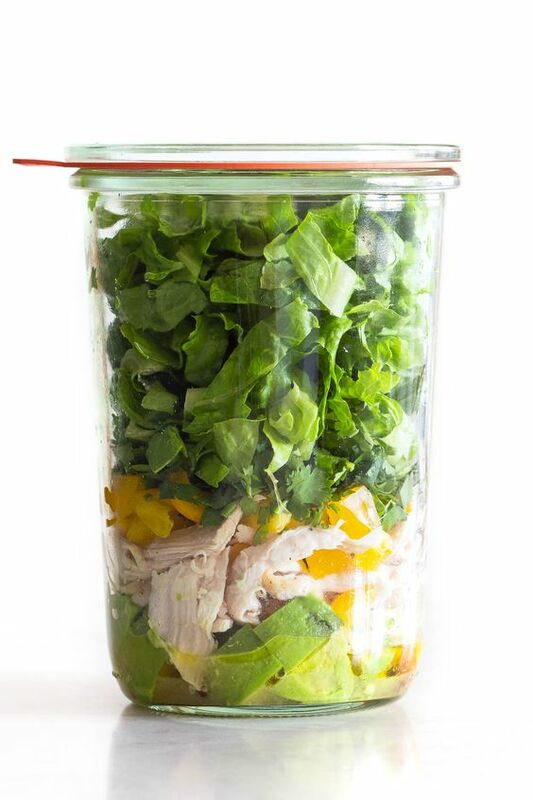 I just love the long fringe at the top and bottom of the jars. 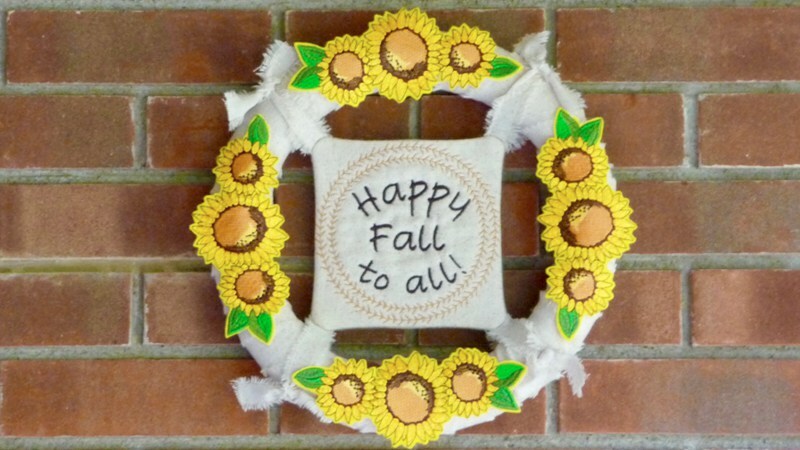 And here is another fall project from Joanne Banko, Fall Wreath–a great post, great project, great tutorial with a great free sunflower swag design. Happy Fall to you all! Enjoy stitching for this colorful season. Valentine’s Day is just around the corner and many readers have already mentioned that they are working of projects for the day that honors love. 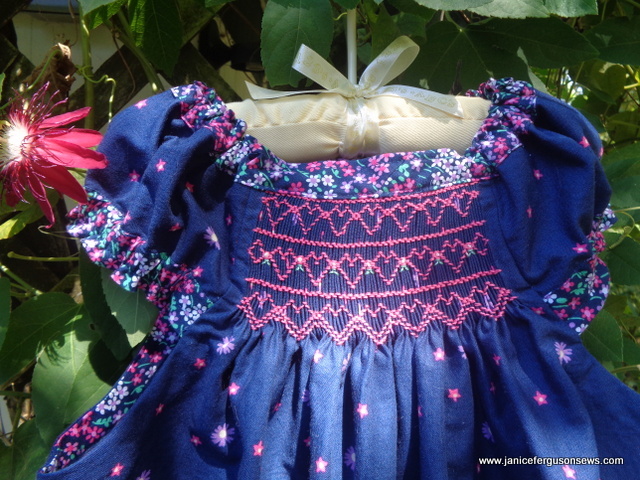 Many, of course, are stitching special outfits for their children or grands. One dear grandmother is making 35 gifts for her grandchildren’s classmates, some pencil toppers and the others toothbrush wraps. I’ve never heard of toothbrush wraps and think it’s something I need to find out about. Do you know anything about them? Others are creating gifts for family and friends. Since not everyone has an embroidery machine, I’m going to be adding blog projects, like this dishtowel, which require only a basic machine. This was one of the many SM1738 machine samples assigned to me by Brother. It is very basic, with only 17 stitches. They include 3 straight stitches–short, medium and longer, 3 zig zags –short and narrow, medium and wider, and longer and much wider, a blind hem and a few others, a look at the video shows how much can be done without all the bells and whistles that owners of high end machines enjoy. I made all of those samples on this machine, except the pillowcase which was made by someone else. You all know I LOVE my Brother Dream Machine, but there is much that can be done on a basic model. It’s likely we all started out with a simple workhorse. The SM1738 is much like my first sewing machine, which as a bride, I used to make curtains and pillows for our first home in 1968. I thought it was to-die-for and stitched miles and miles of seams. I wish I had had some creative suggestions then! To make this towel, I used: a plain white dishtowel, 1/2 yd. 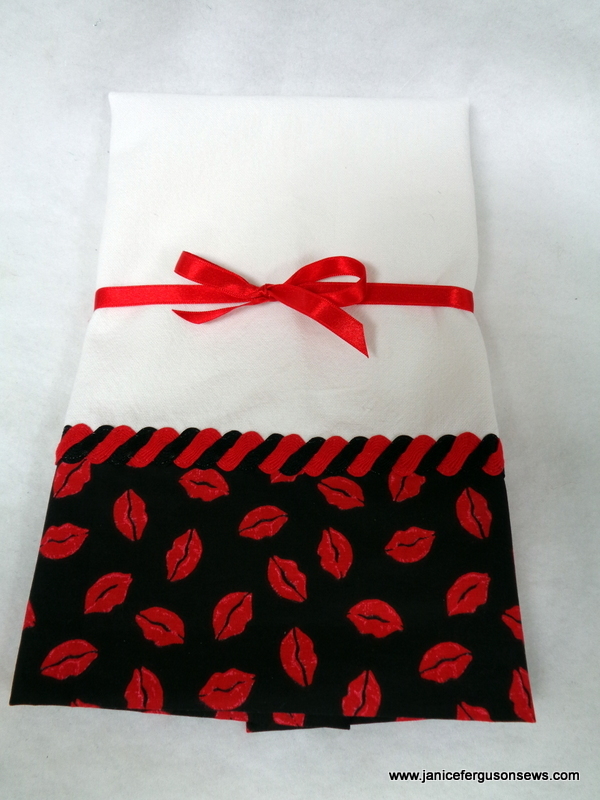 kiss fabric, 2/3 yd. red and 2/3 black rick rack, regular sewing thread and monofilament thread. Cut away hem on dishtowel, leaving a raw edge. Join kiss fabric to raw edge with turntube/burrito hem technique. The tutorial calls for just 1/4 yd. of hem fabric. 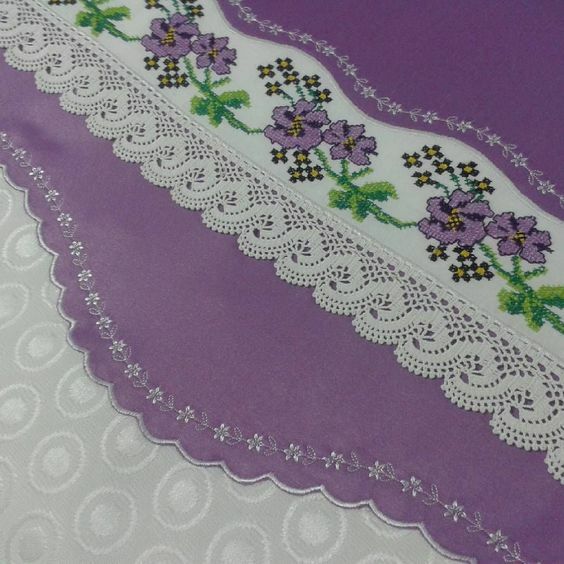 But without embroidery, I wanted a larger hem. The finished hem will be seam’s width less than half the fabric. A quarter yard will render a hem approximately 3 1/2″ wide and the 1/2 yd. 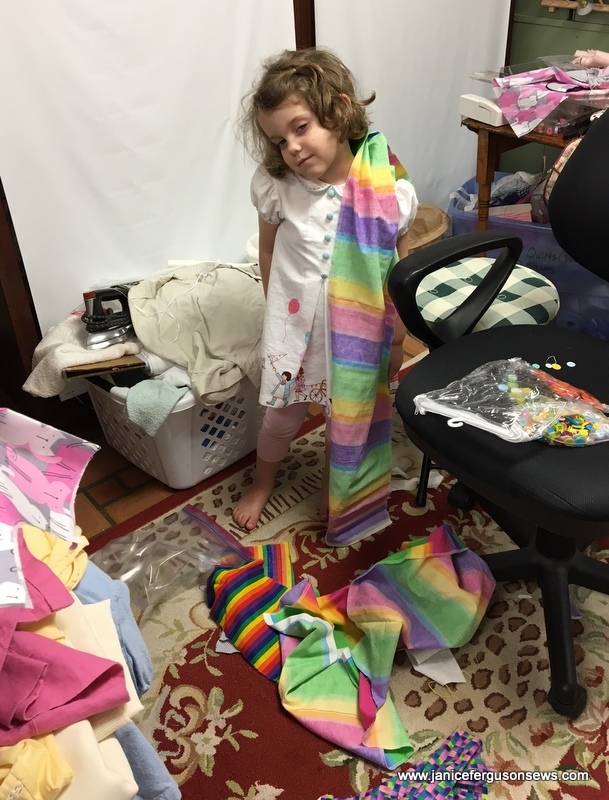 piece used on this towel created a hem of approximately 8 1/2″. Just suit yourself or use available scraps. Twist red and black rick rack together. Baste through the center of rick rack with monofilament thread. Free motion with monofilament and #60 needle over humps of rick rack. 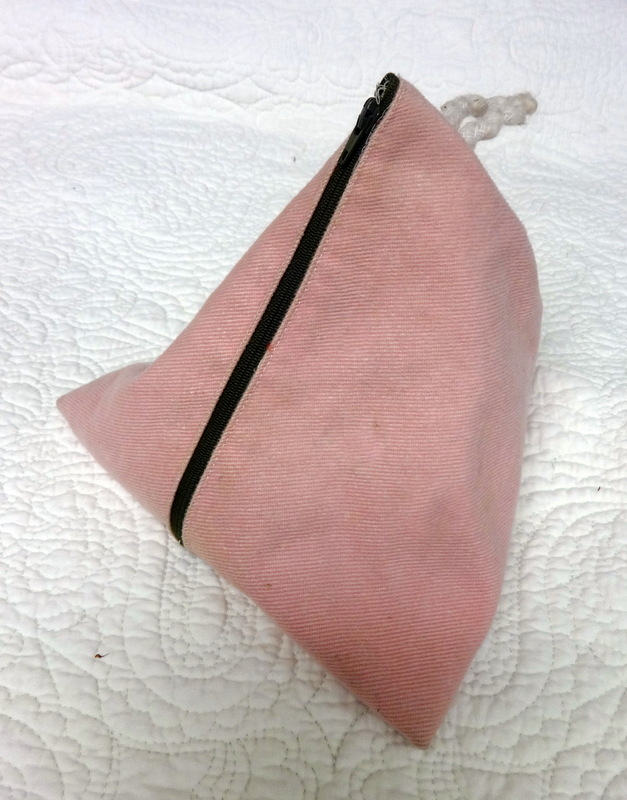 Fold ends to back and tack in place. Remove basting stitches in rick rack. Of course, any print with any color combination of rick rack could be used to make a special dish towel. Kiss the Cook or any other text could be quickly hand embroidered. If you are lucky enough to have an embroidery machine, the addition of text would be a breeze. 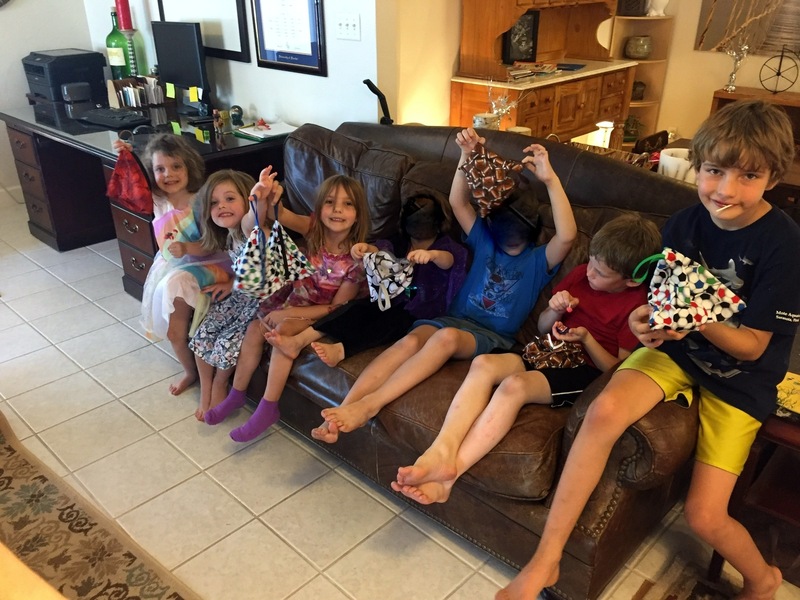 With any sewing machine, you can create fabulous items for your family and friends. This dress and this little girl make my heart sing. Our summer has been so full, so busy, and absolutely fabulous, but this dress is one of the highlights for me. All this busy-ness is why it’s been so long since I have posted. Our pilot son flew the family down from their new home in New Jersey. 11 yo Robert and 13 yo Laurel spent the week visiting with old friends and spending time with their cousin Vivi. What a wonderful family time that was! 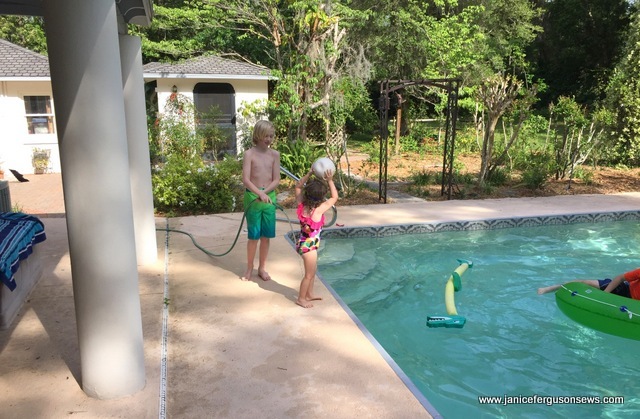 Cousins, pool, golf cart rides, puppies to play with–it was plenty to make them happy. Robert stayed with us when the rest of the family went home. 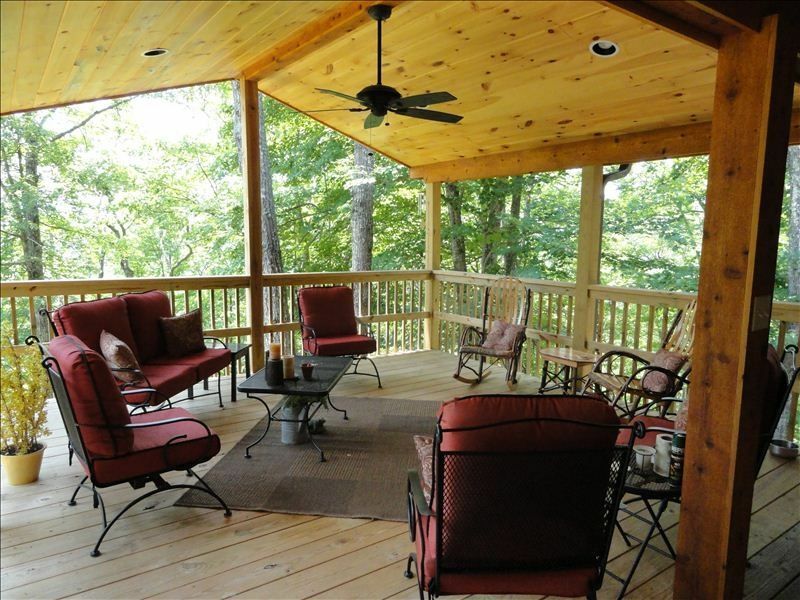 The next day we drove to the North Carolina mountains where we stayed at a fabulous cabin. Now this is a great place to enjoy smocking! At wonderful Bear Ridge Cabin in Brevard, our daughter Rebecca and Vivian Rose joined us while 8 yo Alastair was spending his last week at Camp Watitoh in Massachussets. Our mutual friend Zahra and her two children also joined us while the daddies stayed at home working. The children were just delightful, a special treat for this Nana and Granddad. 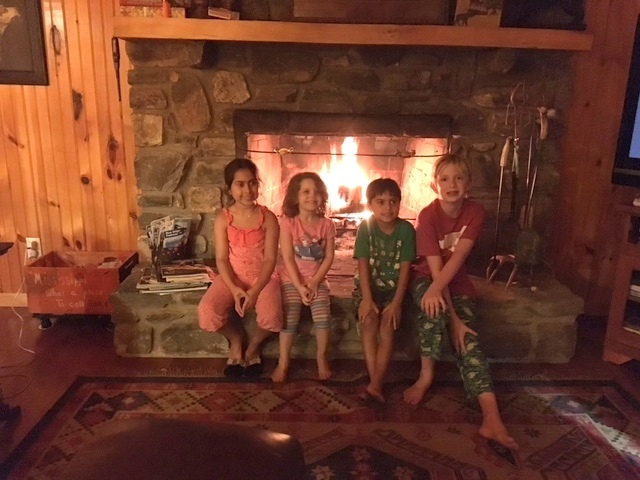 After s’mores, the children were all jammied up and ready for bed. 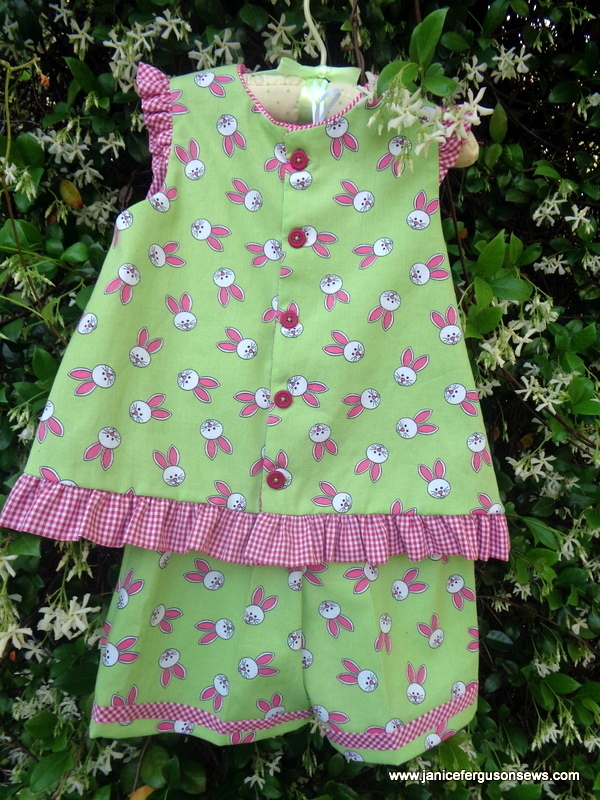 CC Charlotte top and Parker Pants shorts–she likes it!!!! I love the Confederate jasmine in bloom. The scent is heavenly. 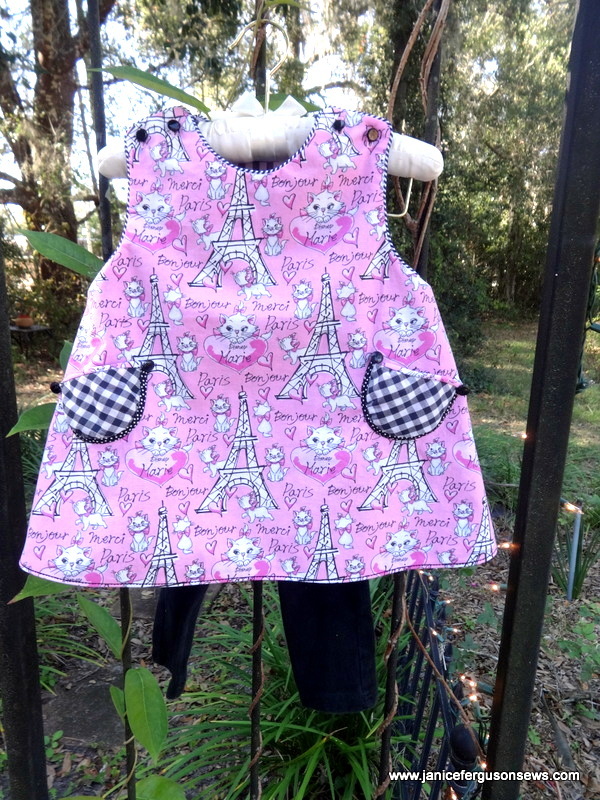 I doubt I’m the only Nana who has issues with what I want to sew and what a child wants to wear. 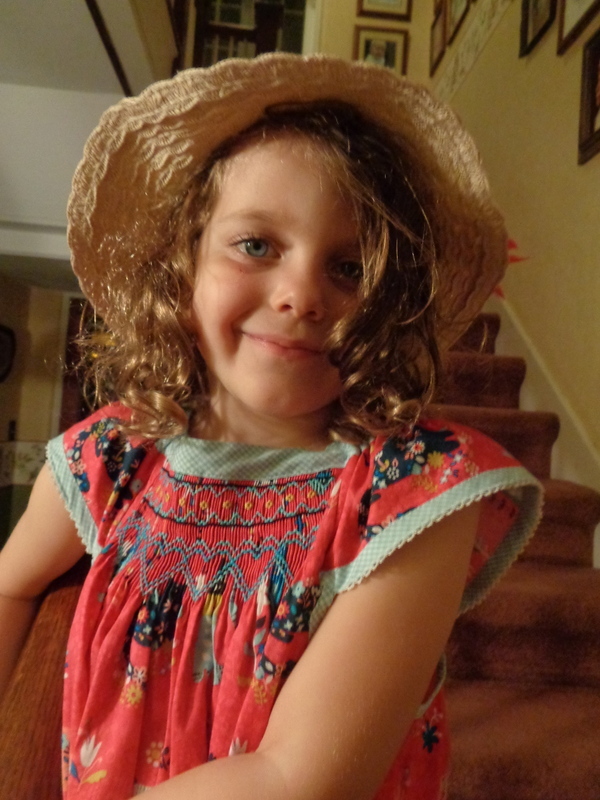 My passion for sewing for my grandchildren and the fashion preferences of 4 yo Vivian have been at odds more and more frequently as she grows. 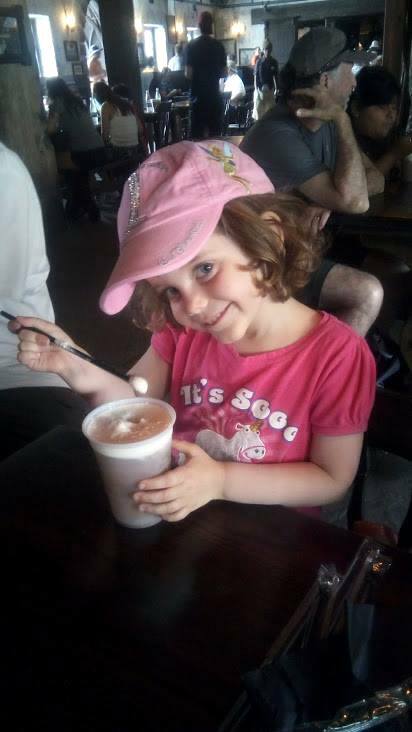 Even at a very early age she had strong preferences for her outer wear. As you can tell from the name of my blog, I am an old fashioned Nana. Vivi is a modern child, 2 generations removed. 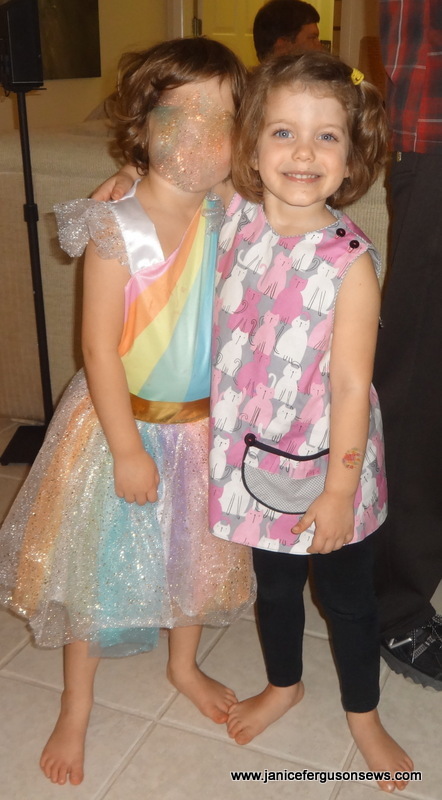 As expected, kitty cat dress #3 was a huge hit. With the dress on a hanger and gray leggings hanging below, we walked through the door to Vivian Rose’s 4th birthday party. She ran to me squealing with delight and ran off to put on the dress. Also as expected, her personal fashion sense demanded different leggings than those provided with the dress. But that was okay with me. Vivi loved the and has worn it repeatedly in the short time she has had it. Again, I used CC Lucy for the pattern after giving up on CC Kitty. 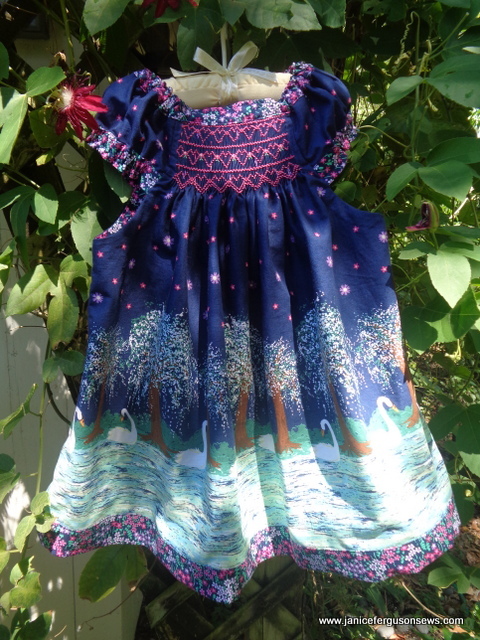 I had cut that dress out with this same fabric the weekend Vivi was here. 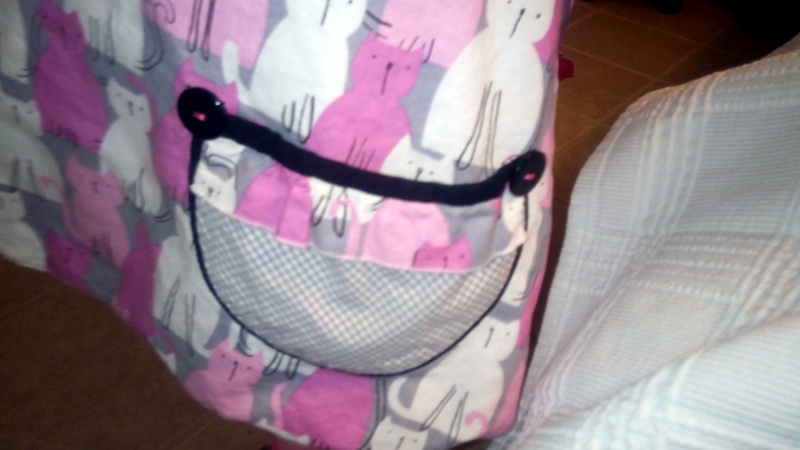 The gray, pink, black and white cats are on a gray background. The dress is lined with gray gingham and trimmed with gray whipstitch piping. Vivian graciously insisted on “helping” me in order to get the dress done more quickly. You might remember this photo of her assisting me. 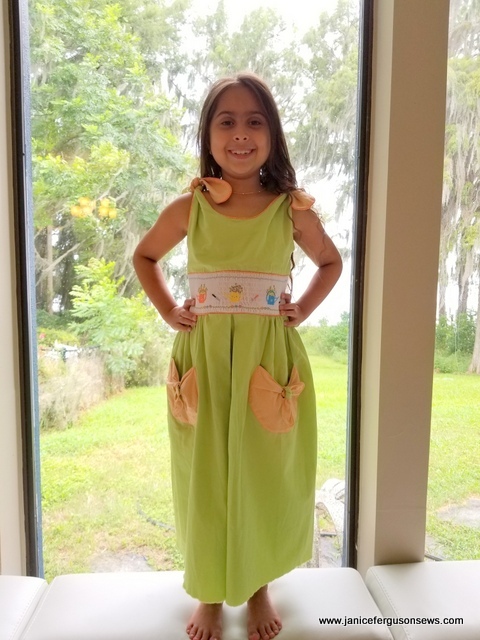 While she “helped me” the guide sheet and the back yoke pattern piece, cut out and still pinned to the fabric, both disappeared, never to be found. Fortunately, I always buy extra fabric and had enough cat print and gray gingham to hunker down and make another Lucy. That is a too-skimpy cat ruffle under the black binding. Her party was a big success. There was a bounce house and the de rigueur pinata, rainbow style. 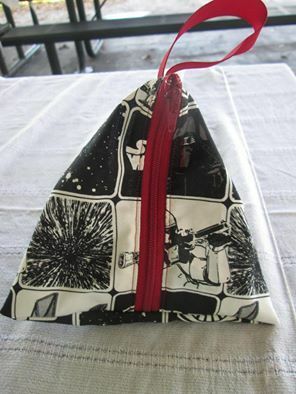 I made 10 teepee bags with scraps from each of her 3 kitty cat dresses. 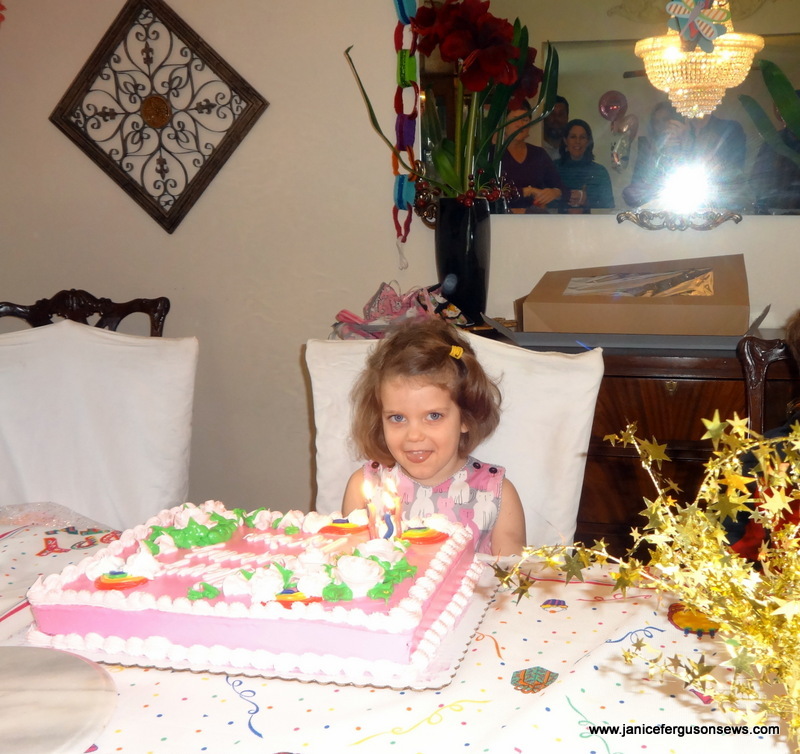 The cake featured her signature roses (for Vivian Rose), tiny cat candies and rainbow. I pray her life be filled with these, sunshine and love and a cat or two. Later, when her mother asked her if the knock on the nose hurt, she replied no. She was just upset about her Aristocats dress and was afraid it was ruined. Rebecca is working on it with our favorite stain stick so the life or death verdict is still out. 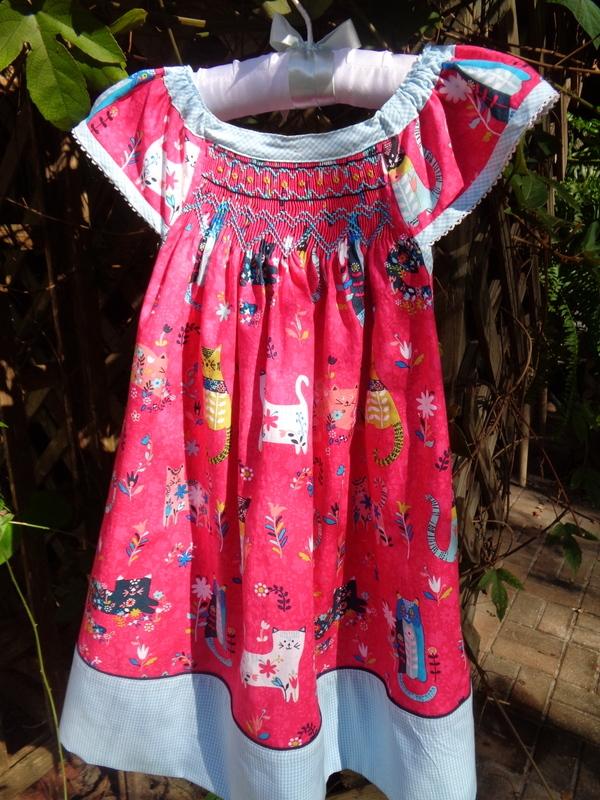 Aristocats dress for my kitty cat loving granddaughter. The next project in the queue is her Easter dress. I doubt she will be crazy about it but it will feature NO cats! And I will really enjoy making it. I love fabric, you love fabric, we all love fabric. But with experience we become more selective about what we choose to sew. 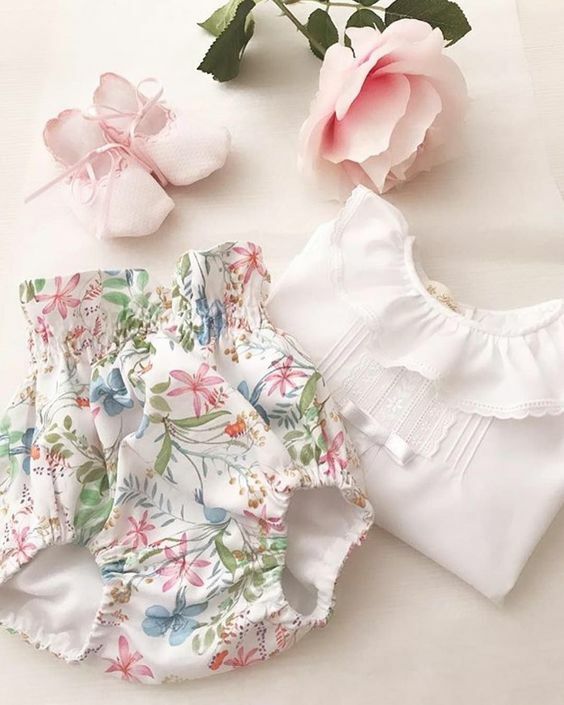 Of course, everyone appreciates the beauty of Swiss batiste, linen, silk, Liberty of London tana lawn, Swiss pique’ and more. 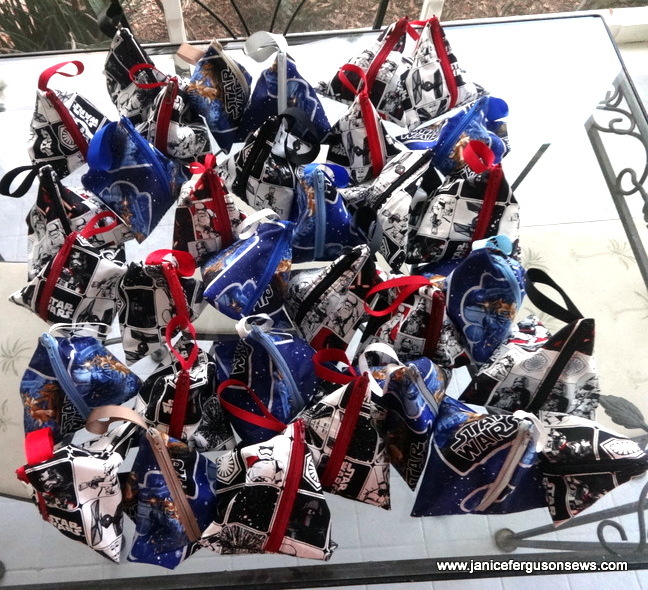 Most sewists praise Michael Miller, Tula Pink and easy care Imperial. But now I have a new love. Seeing that scrappy, pigtailed girl and her fantasy companions portrayed so delicately just delighted me. 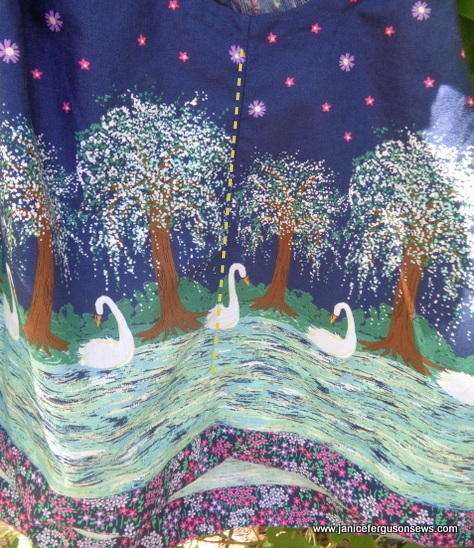 The print is pure innocence and set me to daydreaming. 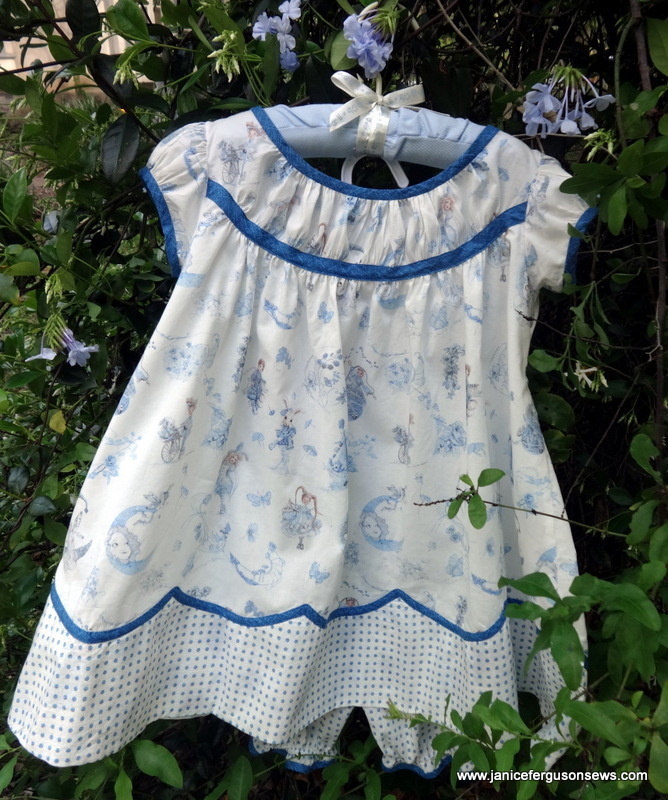 Teamed up with the tiny, fancy dot, also available from Spoonflower, garments for 3 yo granddaughter Vivian Rose danced like visions of sugarplums in my head.